We’ll be performing at Skalidays 2017 on Friday, December 22nd! 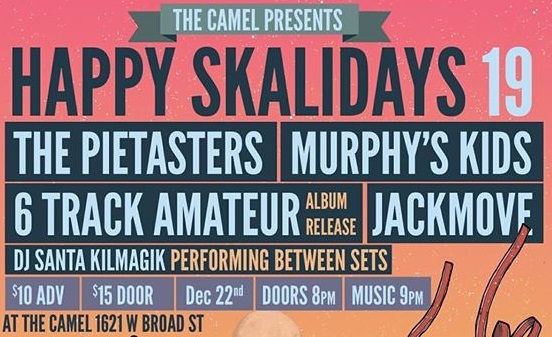 This year’s show will be held at The Camel in Richmond, VA. Also performing will be our good friends Murphy’s Kids, Mylo Shift (formerly 6 Track Amateur), and Jackmove, with Santa Kilmagik spinning songs between sets. Proceeds from the show will be donated to Food Not Bombs RVA. You can purchase tickets via this link. We’ve also added some 2XL sizes for some of the designs. Take a look in the Shop, and thank you for supporting The Pietasters! Would like to book a show in East Windsor CT. In February. Please contactl Steve Stanley .